All continental breakfasts, 5 picnic lunches and 2 evening meals. This walking holiday opens up a timeless world that in the oldest towns takes you back 2000 years. The coastline sparkles with bays and inlets, while inland, castles and palaces in hilltop villages float in the early morning like stone battleships on a swirling sea of valley mist. You begin in Motovun where walks follow high ridges and an abandoned railway offers panoramic views over truffle-rich valleys of oak and fruit orchards, and emerald ranks of vines. From Motovun you walk above the Mirna River valley to the fortified hill town of Buzet. You then head east to the bright lights of the Adriatic Riviera, summiting Istria's highest peak Mt Vojak (1401m) for incredible 360°ree; views as far as the Dolomites and Switzerland. Your final two nights are spent in Opatija, once the playground of the wealthy classes in the C19. Impressive villas line the shore, shops and cafes cluster around C17 churches, and fishermen land their catch just outside bustling local restaurants on crowded marinas. there are swimming opportunities every day. You'll spend three nights in hilltop Motovun in a converted C17 palace with a stunning spa and indoor pool. In Buzet, your accommodation for two nights is a beautiful converted townhouse with indoor pool, set within the original C18 Venetian battlements. Finally in Opatija your 5-star luxury waterfront hotel dates back to 1886 and offers beautiful rooms with period furniture. Dining options are excellent and varied so we have included two dinners with five nights free for you to enjoy local restaurants. Read more about this holiday in our blog. Walks on this holiday are on tracks, country lanes and forest paths. Some sections are stony. Walkers should be confident and moderately fit. Walking boots are essential, walking poles recommended. Arrive at your hotel in hilltop Motovun. Dinner is included on the panoramic terrace tonight. The Kaldir Valley below Motovun is well known locally for fruit, and your ascent through orchards of apples, peaches, cherries and plums passes country shrines and tiny hamlets. A high ridge affords excellent views east to Mt Vojak and west to the sea. Picnic amid olive groves; look out for honey buzzards and listen to lesser spotted woodpecker rattling the pines as you descend back into the valley. Stroll along the castle sentry's walkway around the ancient city walls before dining out in the village. Today's shorter option starts with a transfer (10 mins) to Livade; the longer option departs from the hotel with a steady descent through vines before reaching Livade from where a panoramic walking track (originally a railway abandoned in 1935) leads over aqueducts and bridges. Then it's on through apple orchards and smreka bushes - the berries are used to make local raki - to reach the artists' village of Groznjan. Time to relax, soak up the atmosphere and enjoy the views as far as Slovenia's Julian Alps and Venice whilst waiting for your transfer back to Motovun (20 mins). After a transfer (10 mins) to the ghost village of Bentonici, a winding ascent on a forest trail sprinkled with green-winged orchid leads you high above the clear Mirna River. Church bells chime across valleys of beech from pointed steeples that crown every hilltop. Blue rock thrush flit between branches as you ascend an amazing stone-slab trail used since the Middle Ages by traders and travellers, before descending to Buzet, a Roman settlement on a hilltop with intact C18 Venetian fortifications. High above Buzet, a limestone escarpment runs east to west above shady oak woods peppered with smallholdings. Chickens scatter as you pass through villages leading up onto the ridge for uninterrupted views back to Motovun. You follow the escarpment edge across wind-scoured limestone as Buzet floats on a blanket of cloud below, and paragliders launch themselves into the sky. A descent past country churches and tumbledown villages leads back to the hotel. Mt Vojak, Istria's highest peak, towers 1401m over the east coast in Ucka Nature Park, a haven for many protected flowers and plants. After a transfer (40 mins), you zigzag to the summit for 360Â°ree; views of Croatia's islands and Alpine peaks in Slovenia, Italy and Switzerland. Look out for orange fire lily, amethyst sea holly and bee orchids on the descent. It's then a short transfer (20 mins) to Opatija, where your waterfront hotel in a converted C19 villa awaits. Dine in one of the local restaurants near the marina. The Adriatic Riviera was a playground for the social elite in the C19. Impressive villas with opulent gardens rich in local and exotic plants line the waterfront with views over to the Velebit mountains. A panoramic walkway leads along the sea between yachting marinas and swimming platforms, pretty coves, sea cliffs and azure bays for 6km into Lovran. Enjoy lunch (payable locally) on the waterside with a view over to Cres Island, then either catch the local bus back or stroll home above the waves. Hotel Kastel is within the castle walls of Motovun, right at the very top of the hill. It is a converted family palace dating from the C16. There is a shady terrace with great views where you can have dinner in the evening under the plane trees. Warrens of alleyways lined with artist studios and shops selling local produce surround the central square. It has some lovely outdoor gardens, a state of the art spa with pool and massage suites. Rooms are modern and spacious, with views either onto the square or of the surrounding hills. Dinner is included at the hotel on your first evening, the other evenings you are free to choose from one of the many local restaurants. Hotel Vela Vrata is enclosed within the city walls of the ancient part of Buzet, set on a hilltop at a bend in the Mirna River Valley. 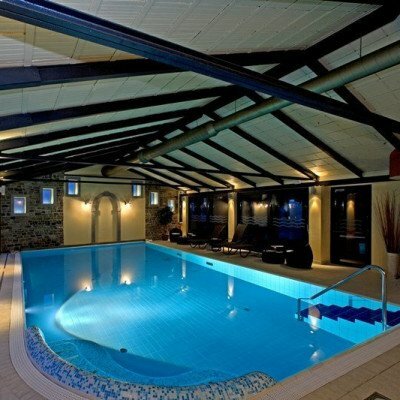 The hotel is a series of 4 converted townhouses that have been beautifully renovated, even including an indoor pool. It has a terrace out the front on the street with views of the hills across the city walls, while inside, still life paintings on the walls and period furniture in the public rooms on the ground floor create an old world atmosphere. Bedrooms are very modern and classy, with state of the art bathrooms. Much of the main (more modern) town of Buzet is a short walk downhill from hotel. Dinner is included at the hotel on your first evening, your second evening is booked on a B&B basis. The Hotel Sveti Jakov is superbly located in the heart of Opatija right next to the park and just across from the Church of St. James. It is also just over 100m from the nearest beach. 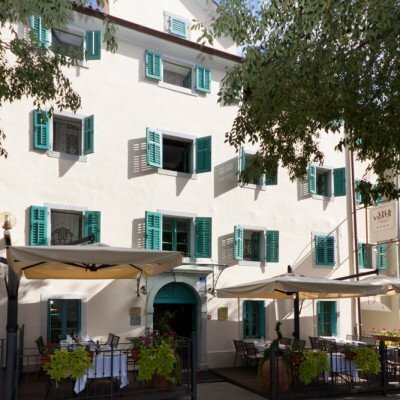 Built in 1886 in the style of the Austro-Hungarian Empire, the hotel is a former aristocratic villa and was known as the long-time residence of the Viennese physician and scientist Julius Glax (born in Vienna in 1846). So fond was he of Opatija that, having moved here, he stayed for the rest of his life. The historically-styled rooms feature elegant parquet flooring, rich fabrics and period furniture along with views of either the city or the gardens. Additionally, you can enjoys views of St. James' Park and the famous Helios and Selene fountain designed by Austrian sculptor Hans Rathausky. With so many local restaurants to choose from, your stay here is on a B&B basis. 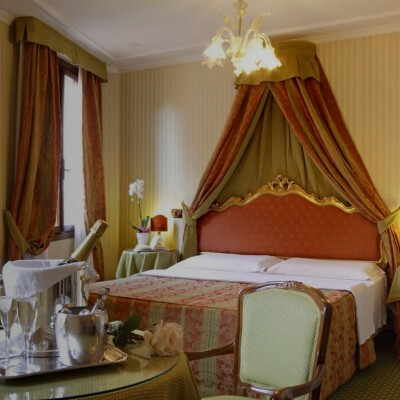 This stunning 19C palazzo has been beautifully converted into an elegant 4 star hotel which simply oozes sophistication. 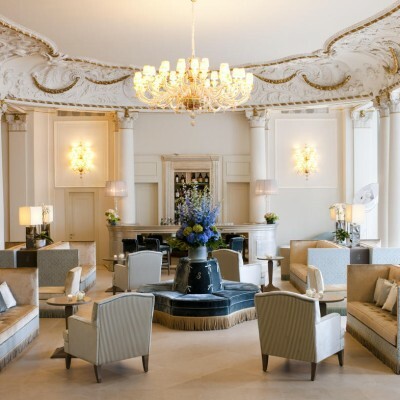 It blends contemporary facilities with classical elegance - expect to see marble columns and ceilings with the original stucco detail as you wander round the luxurious public rooms. The hotel boasts a superb location too, on Trieste's pretty sea front, just a few minutes' stroll from the town's historic centre. There are fantastic views over the Gulf of Trieste, especially from the hotel's panoramic bar. Other facilities include a fitness centre and restaurant. Room upgrades: Superior or Deluxe. Superior rooms come with a view over the Gulf of Trieste as well as bathrobe, slippers, kettle and espresso machine Deluxe rooms are larger with private terrace with view, and come with bathrobe, slippers, kettle and espresso machine Rates available on request. The Hotel Kette is set in the heart of Venice, a short distance from Teatro La Fenice, from via XXII marzo, the elegant shopping street, 2 minutes from piazza San Marco and only 10 minutes from Ponte di Rialto. So this is an excellent base for exploring the many delights Venice has in store. The 63 en suite rooms are immaculately furnished and are fully worthy of the four-star rating. It is possible to reserve a non-smoking room (please contact us and we will request this for you). Transfers included from Pula airport at 12:25, 10:20 28 Sep departure, and back to Pula airport at 10:15, 08:00 28 Sep departure. Istria was a wonderfully unspoiled area, excellent for walking or cycling. Headwater’s walking instructions were clear and easy to follow. Would definitely holiday with Headwater again. Holiday was excellent. Hotels well chosen and sited. Some walking was quite challenging for a group with 5 out of 6 members over 70 ! but, nevertheless, accurately described except for a stretch on the Day 5, Buzet Loop walk ( paragraph 3, page 14 ). Luka and Romina were excellent reps, charming and helpful. We teamed up with another delightful couple, Mr and Mrs Blair. The first walk was the longest and most arduous in the heat and would have been better on Day 2. Those in our group who had previous experience of your holidays would have rated the walks as 2 and a half boot standard rather than 2 boot. Overall it proved to be a very enjoyable holiday and we should like to receive your brochure for future possible holidays..
Istrian Peninsula in Croatia is like stepping back in time. Friendly people, unspoilt countryside and abundance of flora and fauna. Beautiful contrasts of hills and coastal walks and well worth visiting. Fantastic walking holiday in beautiful locations, on top of hillsides and by the sea. The food was excellent and didn't disappoint, but I do like truffles! The hotels were excellent from the rooms, services and cleanliness. The packed lunches were very generous with plenty of variety from the Hostel Kastel. We took extra water on the walks and drank the tap water with no issues. Just leave some energy at the end of the walks to walk back up the hills to 2 of the hotels. Excellent holiday, helped greatly by the local guide customising the walks to suit the needs of the slower walkers. Fantastic hiking trip, Croatia is beautiful. It can be extremely hot in summer, we were lucky though. A well organised trip staying picture postcard pretty hilltop villages. Istria is a beautiful area and the local people are both friendly and helpful. The routes provided were well described and the instructions were easy to follow, but the walking was not as exciting or demanding as I expected. For example, the walk along the disused railway became rather monotonous and the ascent of Mount Ucka was made too easy by giving us a ride to such a high point on the mountain. We were disappointed to find that several of the walks were over too quickly because we followed advice to begin early and avoid the heat of mid-day. While this was sensible advice, there weren't places like bars, cafes, churches or castles available to spend the hottest hours in and so we just completed the walks early. One thing that did surprise me was that the food and wine of the area was of a higher standard than I expected. Thank you for your feedback, we were pleased to read you had an enjoyable holiday overall. We were however sorry to read of your disappointment with the waiting times at the end of the walks, this is the first time that we have received constructive feedback in this area. Please be assured, we will monitor this area for future tours and implement improvements as required. We are sorry for any inconvenience this may have caused you. It was great to read you felt Romina provided a good service. We have passed on your comments to her. She was pleased to receive your positive comments. We would like to thank you for your continued loyalty and look forward to welcoming you on another of our holidays in the future. Our week exceeded all our expectations - the hotels and their services were superb, the walking itself and the notes and maps were wonderful and the transport arrangements could not have been better. Special mention too for the local representative, Romina, who could not have done more to make things perfect. So a great week! I do have to say it is a pity, given our actual experience, that the administration leading up to it was so unsatisfactory. Thank you for taking the time to complete your post-holiday feedback, it was great to read your holiday exceeded your expectations. We were also pleased you felt Romina provided a great service, which helped enhance your holiday. As you can imagine, she was delighted with your comments. We were however sorry to read of your dissatisfaction with the administration of your holiday. Please be assured, your feedback has been discussed with the relevant departments to ensure we continue to provide the excellent Customer Service our customer have come to expect, when booking a Headwater holiday. In closing, we would like to thank you for choosing to travel with Headwater and look forward to welcoming you on another of our holidays in the future. Great little towns and villages perched on hills, connected by excellent walks. We enjoyed the whole experience. Vegan vrata hotel had no hot water in our room on first day and only warmish on second day. Ate there and staff seemed stressed and this did not make for a relaxing evening. Not impressed with this hotel. Excellent hotels, really good walking notes (best we've had! ), good food available locally. very knowlegable rep.
Our journeys on the Castle to Coast Walk took us through some of the most beautiful hill countryside in this relatively unknown region of Croatia. The walks were well-designed, well-described and very enjoyable, and the hotels welcoming and comfortable. Opatija is a gem of a resort and provided an excellent and relaxing conclusion to our trip. The design of the week was very well balanced; the directions astonishingly detailed and accurate; the accommodation superb; Romina the rep absolutely outstandingly excellent. They even got good weather for us. After 22 years of never having an organised holiday we are converts. Could not recommend this more highly. Beautiful and varied walks. Good level of stamina required. Istria is very quiet but local people are very friendly eg a farmer gave us some apples when we resting (and obviously) tired. In the first walk, there was no shade. Walk 2 is longer but a little easier. It would make more sense to swap over walks 1 and 2 to allow travellers to acclimatise. We had a problem with the packed lunches. We mentioned on the application form that we do not eat meat. I rang Headwater the week before the holiday to make sure that this was known and had been passed on to the 2 hotels providing packed lunches. I was told that this would be done. On arrival, we found out that neither hotel knew of our requirements. Clearly, there is communication breakdown. Very well organized, would recommend to all. Croatia is a beautiful country and we enjoyed the contrast between hilltop hotels and two nights on the coast. We did however find the walking tough going at times due to the heat at the beginning of September - 30+ degrees. Maybe that is why there were only 4 of us on the trip, others chose a cooler time of year! The organisation was excellent as we transferred hotels, our Rep and drivers were friendly and very helpful. The food was slightly disappointing as there was little fish on offer until we got to Opatije. The meal at Hotel Vela Vrata was very good, we wished we'd eaten there both nights. We shall await the new season's brochure and plan next year's holiday after checking the expected temperatures. We loved Croatia and in particular the Adriatic riviera which was stunningly beautiful and relatively unspoiled. All the hotels were good and in excellent locations and Romina the rep was fantastic - extremely helpful, friendly and accommodating. The walking was more challenging than we have experienced on other Headwater holidays and not quite as interesting or inspiring. It was very hot walking in July and there were lots of mosquitos - it would probably be a better choice in May or September. We will definitely return to Croatia to explore this beautiful country further. The 2 hill top hotels were excellent. Perhaps more warning should be given that these are steep uphills at the end of the days walk to arrive at hotel. Buzet really had nothing available in the old town, I had thought there might just be a little more, perhaps. Glad we were there only 2 nights. As above maybe reduce prices. The package of walks in Croatia was very good, albeit challenging at times. The local rep was excellent and helpful at all times. The accommodation was well chosen and all transfers were timely and efficient. Overall it was an excellent package and we would recommend it to others. This was our second Headwater walking holiday and lived up to the standards set by the first one. We will certainly look to do similar walking holidays with Headwater in future. Excellent and varied walks in attractive countryside, comfortable friendly hotels and interesting local cuisine with plenty of truffles. Our very helpful local guide, Romina, advised us about possible issues and added to our enjoyment of the holiday. This is one of the best walking holidays we have had with Headwater. Excellent walking notes guided us through a lovely and varied landscape. And the accommodation in all three hotels was of the highest standard; perfect locations too. Some long ascents made for tough walking in parts but with the reward of good views. The spring flowers were wonderful. The stay at Motovun was enjoyable and the last 2 nights in Opatija a delight - pity there wasn't an opportunity to stay longer here since there was a lot to do and some great restaurants. We found Buzet disappointing. Romina (the local rep) was very efficient. Headwater take care of planning process of a walking holiday. They provide efficient and reliable travel arrangements, excellent and interesting accommodation and a superb variety of walks with comprehensive notes. Our guide had walked the routes shortly before to double check their accuracy, attention to detail that reinforced our confidence. Evening meals are arranged for the first night at each location, giving us opportunity to explore, if we wished, on other evenings. In fact, our greatest concern was which wine to drink. Tougher walking than expected. Most days finished with steep climb. Hotels variable, rep. super. Countryside lovely. We decided to have a rest from walking on Day 3 and hired bikes which was a pleasant change. I am undecided as to booking with Headwater again, as there were some issues throughout the holiday which marred the experience. These were not things that Romina could have resolved as they were booking issues. I plan on submitting an email to Headwater shortly detailing these. Some of the walks were challenging. The second day's walk was long at 12,5 miles. Buzet was not a good centre for tourism. The old town was beautiful but nothing there really as was the new town. Unless you wanted to walk back up many steps from the restaurant in the new town, you had onlt the one restaurant in the old town. Food was not brilliant. We ate there on the second night and and they started packing up at 9pm. They did not even ask us if we wanted a dessert or coffee. Just wanted us out. And this was a Saturday night!!!! The walk on the escarpment was beautiful but it was impossible to find the path down again. The notes said it was a hard to find path but it was IMPOSSIBLE. There were four of us and we failed. If the paragliding naturists want their privacy then they should put clear markers where we should go!!!! This was meant to be a 7.5 mile easy walk We used our OS maps to find an alternative roiute but it meant the walk was 11.5 in total.. In the blue book, others had written the same problem. and we did mention to the rep. This was our first holiday with Headwater and we really enjoyed the whole thing. The walks were just what we wanted (helped by excellent weather) with varied terrain and views, we had no problem following the route notes (so hardly bothered with the maps provided) and found the lunches provided by the hotels were more than enough for us. Our rep (Romina) was friendly, helpful and knowledgeable. The hotels were all great and the local restaurants, especially in Motovun and Opatija were excellent and great value. There're plenty of local wines too, which were not expensive and really good! The region is beautiful, the people we met were friendly and we can't wait to go back. Romina was a fantastic representative, both very professional and friendly. When my suitcase failed to arrive from Gatwick, and I had to wait 2 days for it to catch me up, she lent me a waterproof walking jacket and walking sticks. Our Croatian walking holiday was a wonderful experience. The villages were picturesque and stunning in their location and ambience. The walks were through diverse terrain of natural beauty and the food was delicious. Highly enjoyable and thoroughly recommended by us both. A good holiday made especially interesting by Romina the local Rep. She is a lovely person, very helpful and very knowledgable and very willing to share her knowledge of the area. All the hotels were good and their locations very specacular . We wish we could have stayed longer in Hotel Sveti Jacob but had to return home. One night is not enough to enjoy the many attractions of this beautiful place. This was our first holiday with Headwater and we were very impressed. It was a good balance between walking and relaxation. The programme was put together very well: no walking on the first day, a gentle first walk the following day and then the longest walk mid-holiday. By the time we tackled the mountain walk, we were feeling fitter and more able to take on the challenges. It was good to relax by the sea for the last two nights and we enjoyed the coastal walk. It was a great way to discover a new area and we really enjoyed the beautiful countryside in Istria. The hotels were very good and the food was excellent. We would like to single out Romina for particular attention, she was absolutely delightful, intelligent, responsive and very caring, she did a marvellous job. Thank you Headwater, we are very keen to use you again in the future. We had a really good week's walking, albeit in 40 degrees! Croatia was fabulous and we would return in the future. Your representative Romina Brumnic was absolutely excellent and nothing was too much trouble for her to arrange - a real asset. Having enjoyed a previous Headwater walking holiday in Tuscany that was also rated '2 boot' our assessment is that this holiday to Croatia was much harder and a reasonable level of fitness is essential. The hotels are all OK although we were a little disappointed that the swimming pools were indoor. At the Hotel Vela Vrata you had better like truffles! Day 5 walking instructions could be better. As part of the packed lunches (variable quality!) you receive a single small bottle of water - this was wildly insufficient especially in the intense heat of July. Overall though a great holiday, Croatia is beautiful. One of the best Headwater holidays we have done. Croatia certainly more than lived up to our expectations. Everything about the holiday was excellent and the people there were universally warm and welcoming. A wonderful contrast between the hilltop towns of Motovun and Buzet and the classical seaside villas of Opatija. It will be difficult to better this holiday! Beautiful countryside, it was lovely to see so many wild flowers and butterflies (we went at the end of May). There was a good range of walks, all challenging in their own way but with fantastic views as a reward. You do need a relatively good level of fitness as it is hilly and we,d recommend boots as suggested by Headwater as the tracks are very rocky in places. Our favourite location was Motovun, with it's cobbled streets and bars and restaurants overlooking the landscape below. There was little to do or see in Buzet, so make the most of the circular walk whilst you are there. 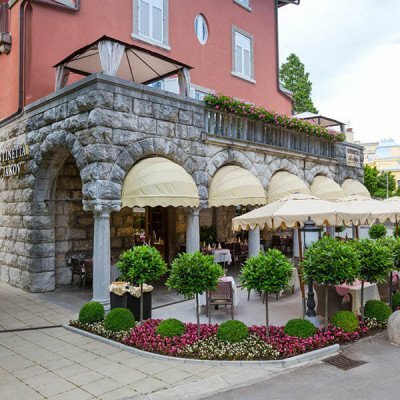 We found all of the hotels to be of a very high standard and the service was good, the room we had in Hotel Sveti Jakov in Opatija was stunning and the hotel was in a lovely quiet part of the town. A superb holiday in stunningly beautiful countryside. Great walking conditions and routes through varied terrain, sometimes challenging and always rewarding. The hotels were first class and staff everywhere were friendly and helpful. The final days in Opatija were relaxing and the effect end to a great holiday. Thank you Headwater! NB. We feel that the route notes for days 4 & 5 could do with adjustment as things appear to have changed on the ground. I would be happy to offer suggestions. Please advise how you would like these to be supplied. Good walking with excellent notes. Excellent accommodation. Helpful local rep. Perhaps overpriced. Very good walking holiday with excellent accomodation. Croatia is a lovely country to visit, the people are friendly, there is plenty to see and the prices are reasonable. Challenging walking with a comfortable hotel at the end of the day. This was one of most enjoyable and exciting Headwater walks we have experienced. Istria was unknown to us and we loved the hill-top towns where the 'truffle is king'! cuisine was superb and the hotel staff and local residents so friendly. The local rep was the most conscientious, helpful and friendly we have ever met. Please extend our thanks to her. The 'good' comment on Comfort at the last hotel related simply to the failure of the air conditioning system which was freezing. This was resolved by the staff. Fabulous holiday and the weather gave us ideal conditions. We chose a walking holiday because we enjoy walking and believe you get more of the atmosphere of where you are if you are on foot. After the airport we were driven to a gem of a hotel, with wonderful views and the sound and sight of swifts in the summer air. Our guide was very efficient and worked very hard to see that we got the most out of our stay. She was local and gave us sound information on what to expect. A couple of the days here saw quite high temperatures so we needed to make sure we had water or knew where we could get water on route.. The hotel at Buzet was also at the top of a peak so this is a holiday where you must be prepared to walk some high ups and downs. The third hotel at Opatija was very well situated and we had a very large room with a baloney. This hotel had a fish restaurant, the fish being caught locally the night before. On our final evening we had one of their superb fish meal on the terrace with the sound of soft live music in the background, which was a fitting closure to a very enjoyable holiday. A thoroughly enjoyable experience. Croatia was a lovely country, the walks just right and the hotels great. The other couple on the walk were like minded and we got on really well. SERVICE IN ENGLAND WAS INFORMATIVE, AS IN ISTRIA (RAMONA). THE HOTEL VELA VRATA WAS VERY DISAPPOINTING. THE ROOM WAS SMALL, THE SHOWER KEPT GOING OFF. ALSO THE AIR CONDITINIONING COULD NOT BE PUT ON. THE ROOM WAS TOO HOT, BUT COULD NOT OPEN THE WINDOW BECAUSE OF THE NOISE FROM THE CAFE DOWN THE ROAD WHICH WENT ON TILL 3AM!! The Istrian peninsula felt like an undiscovered jewel for visitors. Beautiful countryside, great local food and wine and you can walk all day without seeing anyone else! As always with Headwater a lot of thought had been put into the arrangements for the hotel and the walks and the local guide Romina was brilliant. Could have been lovely but spoilt by many problems. Disappointed. Must be our ninth or tenth holiday with you. A very well thought-out tour with the usual Headwater touch of finding interesting as well as luxurious places to stay and devising well-balanced walks to reveal the landscape. We were particularly impressed with the local agent and the two local taxi drivers who were always firendly and helpful. We had a great experience, found all the maps and guides very accurate. The guide was very informative and gave us a good update on changes to the routes. All three hotels were very good and up to the expected standard, we were warned by the guide that the Hotel Bristol was not as good as the others, however we found the room very nice and the buffet particularly good and great value. We enjoyed Croatia and its people were warm and friendly throughout. This walk was not leisurely and required a reasonable level of fitness if it is to be enjoyed. we suggest a few changes to the walks. The walk up to the mountain Ucka would be much better if the trip to Vela Draga was included, also that being on the way. The walk up was fine but should be extended to a walk down the mountain, giving the day much more meaning. The first day,s walk included a long portion on an old railway path. A little weary and boring. The last two kilometres were hell for all who dislike mosquitoes. The representative was asked directly at the info meeting about the mosquitoes and did not give correct information. Many walkers were bitten badly and the walk finished at the same spot the next day. The walk to Buzet was the best walk. More walks like this are very positive. We found many other places Headwater could have had focus. Why not include trips to Roc and Hum? Walking in this area was sublime. We also would have liked more descriptions about the things to do around places, since the local tourist offices were not on the ball at all. The biggest let down was the Hotel Bristol, inspite of the warning that the standard was lower. We expected a better welcome and expected a refrigerato in the room. Headwater would do better with a quality boutique hotel alternative, many of which we found attractive. We reccommend choosing a place away from Lovran, a town that was full of run down and ruined buildings. Volosko was a better alternative. Up in the hilltops were many OK places. We joined this trip to walk with family who had used your services before and were impressed by the standard of hotels and restaurants. They were offended by the standard at the Bristol. We thought the whole place was tatty. We hope our feedback will inspire improvements. We will certainly return to Croatia, but reccommend visits to other places as well. Nice walking companions make a trip such as this ideal for up to 8 people. As a new holiday this year it all worked very well indeed. Istria is a lovely area and at the very beginning of July we were treated to abundant wild flowers, butterflies by the thousands, gorgeous views and stunning weather (though hotter then we had expected). Most days though we did have shaded sections to walk through. Loved the two hilltop towns we stayed in (Motovun and Buzet) and after leaving Buzet we did do a small (half hour) detour to visit the Vela Draga before starting our walk up Mount Ucka. We really enjoyed our walks through unspoilt countryside, the wild flowers and butterflies in particular were delightful.The hotels in Motovun and Buzet were both excellent, and we enjoyed the food and wine. No minimum group size, however transfers are subject to at least 2 people (in total) booked on each departure. Self-guided walking Managed locally by Headwater appointed agent. Selected Tuesdays from 7th May 2019 to 28th Sep 2019, for 7 nights. All dates are subject to availability, please contact us to check. Due to the tailor-made nature of our holidays, we need a little more information in order for us to check availability for Castles to Coast Walk. Simply complete the form below and a member of our sales team will contact you (when it's most convenient for you) to provide availability information, travel options and an accurate price. Of course there's no obligation, but if you do wish to proceed with a booking they will be on-hand to assist you throughout the process.